ScotRail has announced plans to recruit up to 100 new train drivers. The rail operator said recruiting trainees at depots across the country would support the expansion of timetables and roll-out "faster, bigger and greener" trains. The roles will be based in Aberdeen, Ayr, Bathgate, Edinburgh, Glasgow, Gourock, Helensburgh, Inverness, Perth, Stirling and Tweedbank. Train drivers' union Aslef welcomed the announcement. Trainees will be paid £24,559 during their first year. This will gradually increase to £43,212, following a probationary period. ScotRail Alliance managing director Phil Verster said: "We're investing in Scotland's railways by modernising trains, expanding timetables and adding journey options - and recruiting a large group of new drivers is vital to make these improvements possible. "We are proud to be supporting local communities and the Scottish economy by creating quality jobs that will make a real impact for customers." ScotRail said it wanted to hear from "enthusiastic, reliable candidates with excellent attention spans, experience of safety-critical roles and a passion for customer service". 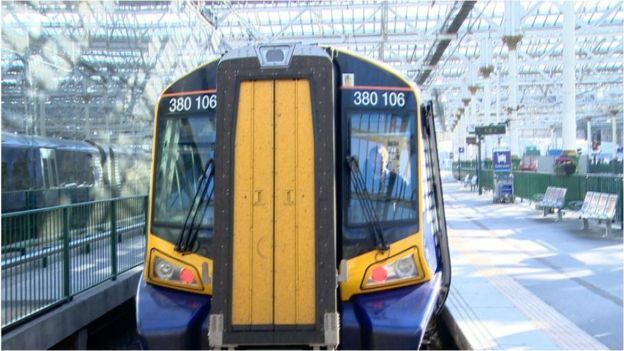 Scottish Transport Minister Derek Mackay said: "The Scottish government is investing record levels in Scotland's railways with a £5bn package to upgrade trains, track and services across the country. "Key investment in infrastructure, such as the recent historic reopening of the Borders Railway and our substantial programme of electrification, are only part of the story. "The staff who keep our railways running are a key asset and I am delighted to launch this unprecedented, nationwide recruitment drive that will create up to 100 new train driver jobs." Kevin Lindsay, Scottish secretary of Aslef, said: "This is a great opportunity for all sections of our community to apply to join the railway. "As a union, we look forwarded to continuing our good working relationship with the Scottish government and Abellio as we jointly develop and deliver Scotland's railways."